WE ARE NOW SHARK CAGE DIVING WITH THE SEVEN GILLED COW SHARKS. These rarely seen sharks are extremely special. There is nowhere else in the world where they can be so easily accessed as in False Bay. They are found in between the shallow kelp forests in Marine Protected reef areas and now seen at Seal Island in False Bay. Cow Sharks will readily approach divers to get a closer look which means they swim right up to you and only turn at the very last minute. The size range seen by divers is between 1 – 3 meters. 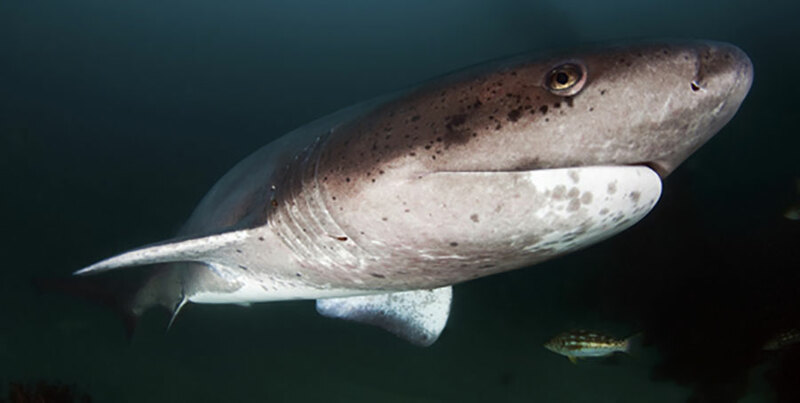 The Seven gilled Cowsharks are very curious and confident sharks. During certain times of the year we find them at Seal Island, False Bay. We have been fortunate enough to see regularly enough at one location to be able to confidently guide dives there with an 85% chance of success. Get up close with Cow Sharks . And we offer scuba dives to view these rare Cow Sharks! Book with us in False Bay! 06h30 Sharp on the Simon’s Town Pier. Around 4.30 Hours at sea. We take a maximum of 18 people. Dive briefing and full shark presentation. Cage diving = no experience. Keep your hands in the shark cage. Do not attempt to touch the sharks. Book now for the best Seven Gilled Cow Shark tour EVER!